If you haven't already noticed, I'm a big admirer of great poster designs. Unfortunately we all too often see a lot of terrible posters over the year. So when one pops up that breaks the norm and looks fantastic, I'm always excited to share it. And thankfully, Steven Soderbergh's Che has been gaining momentum anyway due to its expansion into 9 more cities over the next few weeks. 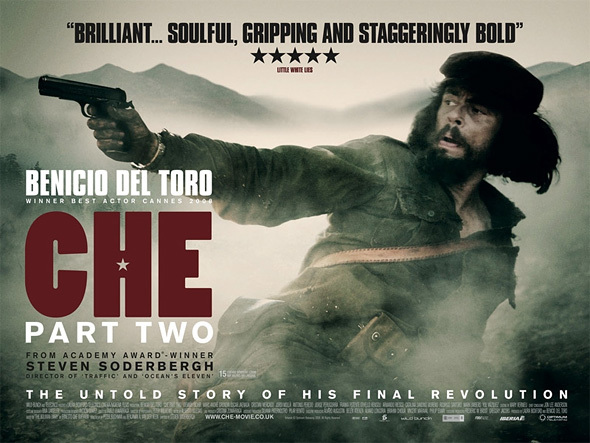 Thanks to Empire we've got our first look at the UK quad poster for Che: Part Two. The reason why I love this poster so much is because they took a considerably old and stale photo and gave it new life and new energy on a fantastic poster. For those interested, the back-to-back "Roadshow Edition" of Che will be expanding to theaters in Boston, Chicago, Dallas, Houston, Minneapolis, Philadelphia, San Francisco, Seattle, and Washington DC starting on January 16th. Additionally, beginning on January 21st, Che will also be available at home via IFC In Theaters on-demand service. I highly suggest checking it out in theaters if you have the opportunity! OH MY GOD GET POSTER!!!!! STUPID MOVIE!!!!!!!!!!!!!! BORING & BAD ACTING!!! Nuked the fridge! As films go, Part 1 was better - saw them as one complete film with an intermission.. it should never have been split into 2 films - if people catch 2 on its own - there will be disappointment. Oh an that poster has had some photoshop work done to it - when he's pointing his gun like that, he's on a hillside with trees covering all around, there is no mountain landscape like that. It's his last stand if you will. lando - have you seen the film? Awesome! I'll be sure to catch the Philly showing. can anyone tell me if part 1 is 4 hours long or that the total time of part 1 and 2? Seen it, liked benicio, liked the camera work, didnt care for the movie. I understand the "Americanized propaganda" fear, but my viewpoint comes directly from families that were there under his oppressive boot! a family who had a sick child but werent allowed to seek the best doctors out of fear that they would leave..Ive grown up in Miami since the 70's and have met people (besides family members) who fought side by side with "Cliche' Guevara" and know from first hand accounts what an oppressive hypocritical prick this man truly was! Even those who supported the revolution were betrayed by Cliche, Fidel and crew! so you can spout all the pseudo revolutionary crap from your over the counter revolution (TV SHOWS) without knowing first hand what you are talking about and let the grown ups express known fact, not made up memoirs. Memoirs are written by the person and not absolute fact..Im sure hitlers memoirs would have been just as "Brilliant" or perhaps best read as "Another point of view, HIS point of view"? You can change words and definitions and try to make yourself look great after the fact, but crap is still crap. No matter how idolized or politicaly corrected you dress your life to be.